This month's Backpacker Magazine has a list of ten rookie mistakes that hikers should avoid. It's all well and good, but we think they left a few things out. Here are the top five rookie mistakes that we have seen on the trail. forces, and the rocks around the edges are not your friends. Once in a river, it is very difficult to get back out--and every year people die in the Sierra because they don't understand this. Sure, it's fine to dip your feet in the water at the end of the day, particularly in a nice mountain lake. But do NOT underestimate the power of a Sierra River. The people who stupidly wade in the Merced River above Vernal or Nevada Falls in Yosemite think that its looks rather peaceful and cool. That's just before they lose their footing, slip into the water, and then realize that they are going to go right over the falls. 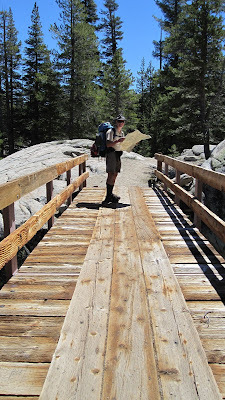 You NEVER have to cross a stream or river in the Sierra. You can always go back another way, find a log to cross, or just wait a few hours (or even a few days!) for the water level to drop. Veterans know this. Rookies don't. navigation courses they teach you to make a mark on the map every time you can confirm your position---that allows you to go back to that spot, at least, and know where you are. If you do that, you should also be able to predict the next step of the hike, and check it off when you get there. That's P, on the right, checking the map to make sure he is on the bridge---which is one landmark you can always identify on a map! And if you are new to the area, or new to hiking, ask questions of people who look like they've done this before. They are not the ones with the biggest or newest packs. They are usually the ones who look a little shopworn around the edges. 3. Getting dehydrated. Remember that when you are hiking in the Sierra Nevada, you are usually hiking above 6,000 feet, and in air that has a relative humidity WAY below what you see at home. That means that your body gets dehydrated really fast. Know that feeling when you spend six hours on an airplane? Most of that is dehydration, and it happens in only a couple of hours. Imagine spending twelve hours on the plane...and carrying a pack uphill for most of that time. You are dehydrated. The solution is to drink all the time. We drink every 20-30 minutes on the trail, just the way P does when he is biking hard at home. And we always drink a lot of water at every rest stop, and at night, and every morning before we hit the trail. Simple test? If you are not peeing every couple of hours, and your pee is anything but light and clear, you are probably getting dehydrated. Among the effects of dehydration is losing mental acuity---which means you make stupid decisions--decisions about things like where you are, what you should do next, and how you are feeling. 4. Getting hypothermic. We once met a couple at the top of a climb, and the minute they stopped hiking, the young woman starting shivering uncontrollably. While her partner assured her that everything was just fine, we assured her that she needed to put on something warm immediately. When you are hiking, your body creates enough heat to counteract a lot of cold temperatures. But the minute you stop, that cold weather takes effect, You need to stay warm, and you need to put on clothes the minute you feel cold. Your body, when it gets cold, directs most of the blood and warmth of your body to your torso, to keep your heart and lungs warm. That means less blood to your brain. You brain is what you need to make the smart decisions when you are hiking. You need blood up there. Stay warm. That's M with our friend Robin in June in Yosemite at left. And they are hiking warm. 5. Not eating enough. Once we had kids, we really understood how important a little food can be. Normally delightful children can turn into monsters when they are hungry---and adults do this on the trail, as well. We've met quite a few people on the trail who were having a bad day, and we're pretty sure that most of them were hiking without enough food. We normally eat breakfast and then have a snack about 90 minutes into the hike. We do that because we know that we are using more calories than at home, and we need to keep the body fueled for that kind of activity. Even on a day-hike you should take some energy bars and fruit. It's amazing what a difference they can make, and there are few pleasures greater than sharing a snack at the top of a peak or the foot of a waterfall.